An exceptional quality trad climbing crag with routes up to 60m on immaculate rock. 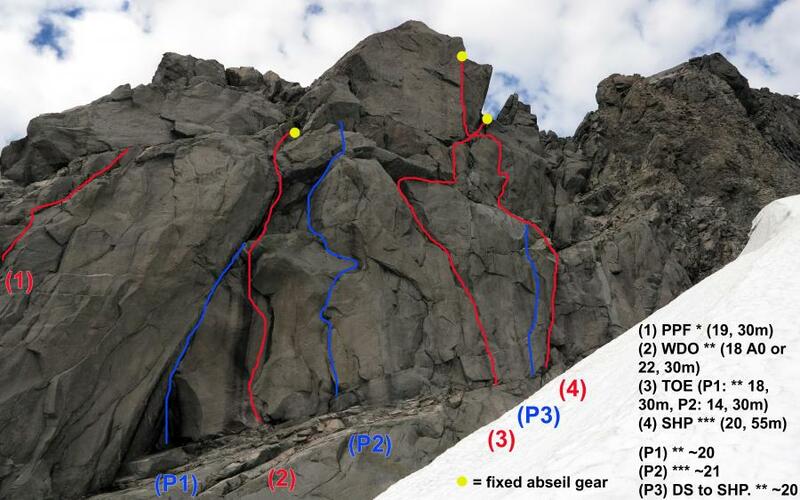 Predominately crack/flake climbing with outstanding rock features and unbeatable ambience (views of Tutoko, Milford Sound, the Central Darrans etc). Superlatives abound. Crackheads will delight in the laybacks, jamming and bomber gear of this lovely block of rock. 3/3 climbers agree, Sexual Harassment Panda (20, ***) is well worth the walk from Homer. Let's keep the crag clean please, there is plenty of gear available and bolts aren't needed. All established routes have in-situ trad anchors but take your own cord and use discretion when abseiling off this gear. Walk up Gertrude Valley, cross outlet Black Lake. Head towards Talbot East Ridge, fastest route being a ledge system between the Sickle Crag and the Bog Farmer slabs. Then head up easy slabs and then snow to a point 1/3 up the East Ridge. The crag is centred on a prominent immaculate block of rock, that happens to be the usual abseil spot for those climbing the full East Ridge of Talbot. Needs a few hours to dry out after rain, some routes may need more. Crack system takes you to a ledge - tricky moves lead up and into a right facing corner. At the top move right 5 m on easy ground to find fixed wires and carabiners and rap as for Woodsy. Named for the first ascentionist's fear of insects, which nearly resulted in a large whipper when a key hold revealed a family of alpine weta. 22 free or 18 A0. Up the immaculate layback to undercling, one offwidth move to big ledge then committing rock-over left into corner. Fixed abseil gear at top. Needs time to dry or will have slugs. A wandering pitch with great hand traverses and a fantastic hanging belay on the RHS of the obvious roof. A stellar pitch of climbing with a great top out on the East Ridge of Talbot. The must-do pitch at the crag. Follow line of weakness tending right before rocking over onto the face, aiming for an obvious } shaped flake. Up immaculate layback to ledge. Then, finger crack follows the obvious corner L into a slightly overhanging hand-jam crack. Top out on ridge and look for assorted slings on boulder (carabiners in situ, please leave these). 60m ropes get you to the ground. Could be split into 2 pitches at ledge, P1 17, 40m, P2 20, 15 m.
Straight up into SHP. Small cams and wires. Warning serious ground fall potential during hard moves before reaching gear in R facing seam. P3 in photo above.